This morning at about 7:45 a.m. CST, I received a text message from Troy Davis' sister, Martina Correia, letting me know that the Georgia Board of Pardon and Paroles denied Troy Davis clemency after listening to the plea of his legal team in a hearing on Monday, September 19. 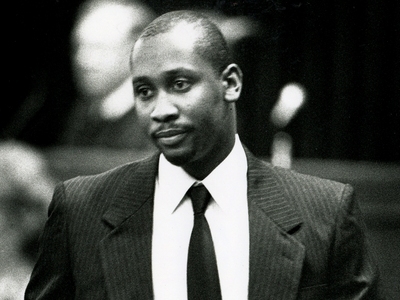 Mr. Davis was convicted and sentenced to death in 1991 for the murder of Savannah police officer Mark MacPhail. The parole board has the authority to commute a death sentence to life without parole or deny clemency. Mr. Davis is scheduled to be executed by lethal injection on Sept. 21 at 7 p.m. EDT, at the Georgia Diagnostic and Classification Prison in Jackson, GA., where he has been an inmate for over 20 years. People can still call Chatham County DA Larry Chisolm at (912)-652-7308 and demand withdrawal of the death warrant. In an urgent email sent out this morning, Laura Moye of Amnesty International said "It is with a very heavy heart and a deep sense of outrage that I let you know that the Georgia Board of Pardons and Paroles voted to deny clemency to Troy Davis. The actions of the Board are astounding in the face of so much doubt in the case against Troy Davis. However, we are not prepared to accept the decision and let anyone with the power to stop the execution off the hook. Join us in calling on the Board to reconsider its decision, and on the Chatham County (Savannah) District Attorney Larry Chisolm to do the right thing. They have until the final moments before Troy's scheduled execution to put the brakes on this runaway justice system." Sign the Amnesty International petition online here to be sent directly to DA Chisolm. It's not over! Too Much Doubt! 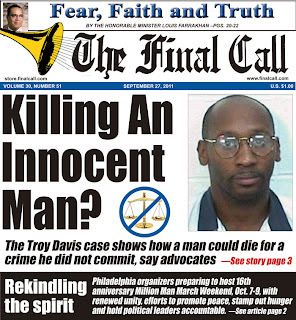 Continue to fight for Troy Davis. Read the latest front cover report on this case that I wrote for The Final Call Newspaper @ http://www.finalcall.com/artman/publish/National_News_2/article_8162.shtml. We will keep you updated on this developing story.